A publishing event: #1 New York Times-bestselling author Jan Karon returns--and invites her millions of fans to join her again in Mitford. After five hectic years of retirement from Lord's Chapel, Father Tim Kavanagh returns with his wife, Cynthia, from a so-called pleasure trip to the land of his Irish ancestors. While glad to be at home in Mitford, something is definitely missing: a pulpit. But when he's offered one, he decides he doesn't want it. Maybe he's lost his passion. His adopted son, Dooley, wrestles with his own passion--for the beautiful and gifted Lace Turner, and his vision to become a successful country vet. Dooley's brother, Sammy, still enraged by his mother's abandonment, destroys one of Father Tim's prized possessions. And Hope Murphy, owner of Happy Endings bookstore, struggles with the potential loss of her unborn child and her hard-won business. All this as Wanda's Feel Good Café opens, a romance catches fire through an Internet word game, their former mayor hatches a reelection campaign to throw the bums out, and the weekly Muse poses a probing inquiry: Does Mitford still take care of its own? Millions of fans will applaud the chance to spend time, once more, in the often comic and utterly human presence of Jan Karon's characters. Indeed, they have never been more sympathetic, bighearted, and engaging. 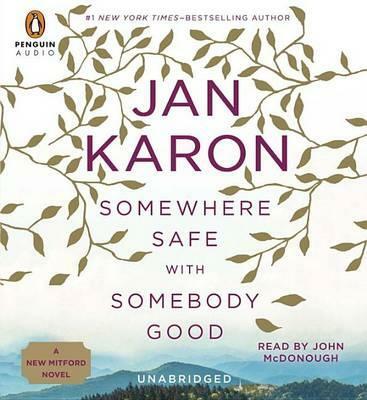 Fantastic reviews for SOMEWHERE SAFE WITH SOMEBODY GOOD "Karon knits Mitford's small-town characters and multiple story lines into a cozy sweater of a book.... Somewhere Safe hits the sweet spot at the intersection of your heart and your funny bone. 4/4 stars" -- USA Today "Welcome home, Mitford fans...to Karon's gift for illuminating the struggles that creep into everyday lives--along with a vividly imagined world." --People "With the homecoming of much-beloved characters and a few new additions, Karon's latest provides a return to a setting readers have been clamoring to revisit. Longtime readers will not be disappointed by the author's latest cozy redemption tale." --Library Journal "The faster and more impersonal the world becomes, the more we need...Mitford." -- Cleveland Plain Dealer "Loyal fans of Karon's Mitford novels and Father Tim will be delighted once again to spend time in this quintessential American village with its leading citizen and his colorful coterie of friends, family, and dependent souls." Jan Karon is the #1 New York Times-bestselling author of twenty-three books, including the Mitford novels, the Father Tim novels, a popular cookbook, and several books for children. She lives near Mr. Jefferson's Monticello, a World Heritage site in Central Virginia.